On two Saturdays in September, five locations in Granville will 'open their doors' along with other historic buildings and landmarks across the state. 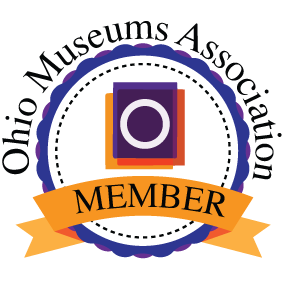 “Ohio Open Doors” was created in 2016 by The Ohio History Connection to promote and inspire pride in Ohio's heritage. Granville sites include the Buxton Inn, the Old Academy Building, the Old Colony Burying Ground, the Robbins-Hunter Museum, and St. Luke's Church. All Ohio Open Doors events are free and photography is permitted. For a complete list of all sites open in Ohio go to https://www.ohiohistory.org/preserve/state-historic-preservation-office/ohio-open-doors. 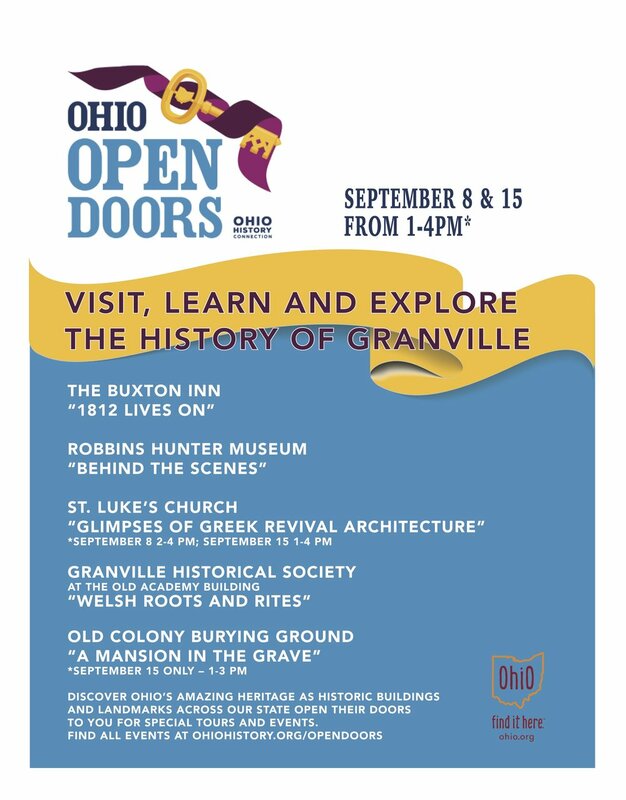 Tour maps of all Granville locations will be available at each of the Open Door sites in the village. • Visitors to the Historic Buxton Inn, 313 E. Broadway, where “1812 Lives On” will learn about the Inn's past through conversation and displays. The Inn has been in continuous operation since 1812 and will be open to visitors on September 8 and 15 from 1 – 4 PM. • The Granville Historical Society presents “Welsh Roots and Rites at the Old Academy Building” located at 103 E. Elm Street. This illuminating exhibit will feature the cultural background of local Welsh settlers. The exhibit will include the history of the building which at one time was the Welsh Congregational Church and will be open on September 8 and 15 from 1 – 4 PM. 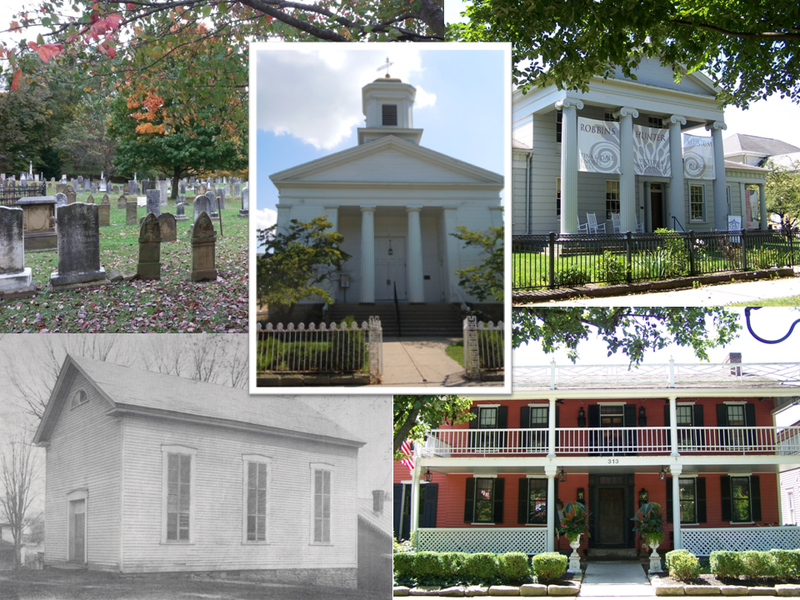 • For “A Mansion in the Grave: A Ghost Walk with the Headstone Carver,” (Sep. 15 ONLY, 1:00-3:00 p.m.) Granville's historic Old Colony Burying Ground on South Main Street will host tours escorted by the "ghost" of Thomas Hughes (1779-1851), a Welsh immigrant who was one of this Ohio village's leading stone carvers of the 19th century. Mr. Hughes will lead visitors through the 1805 graveyard, showing you his most beautiful handiwork, and introducing you to several other friendly ghosts of early Granvilleans whose graves are marked by the headstones he carved. These family-friendly walking tours will start at the north gate about every 15 minutes on the quarter-hour. Walks will take place on Saturday, September 15 only from 1 – 3 PM. • “Behind the Scenes” in the architecturally significant Avery-Downer House/Robbins-Hunter Museum at 221 East Broadway will take visitors from the basement Kappa Sigma Chapter Room to the Victoria Woodhull Clock Tower. Tours take place on September 8 and 15 from 1 – 4 PM. • For “Glimpses of Greek Revival Architecture in Granville’s Episcopal Church,” St. Luke’s Church, at 107 East Broadway, represented by members and friends of the Historic Preservation Committee, will welcome visitors and provide information on the Greek temple design and stunning interior ornamental motifs and artifacts of this 1837 Episcopal church. They'll also share stories of some of the people who have been part of its 191-year history as a worshiping community. The church will be open on September 8 from 2 – 4 PM and September 15 from 1 – 4 PM.